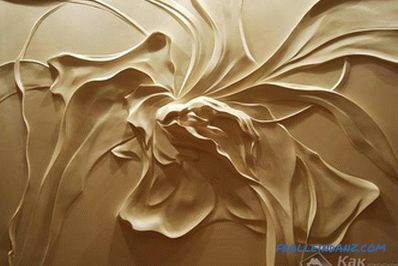 Gypsum decorations will add individuality to interior design. 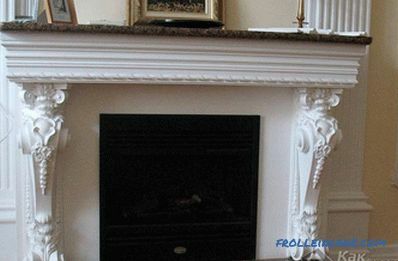 In addition, stucco can be used quite widely, in various styles of the room. 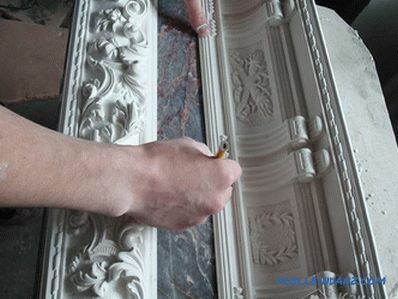 In the article we will tell you how to make stucco from gypsum with your own hands (at home), we will give step by step instructions for making. 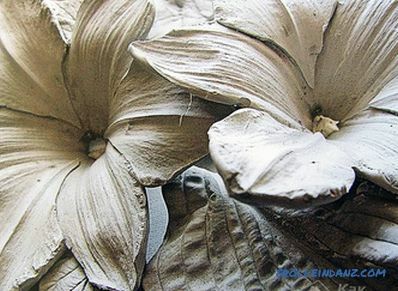 A variety of gypsum stucco today is not limited to the creation of figures of thick-cheeked cupids, elegant lines of flowers and petals, and indoor cornices. 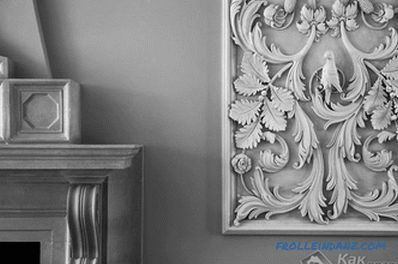 With this material, you can create an imitation fireplace, "grow" a tree on the vertical surface of the wall or on the ceiling. 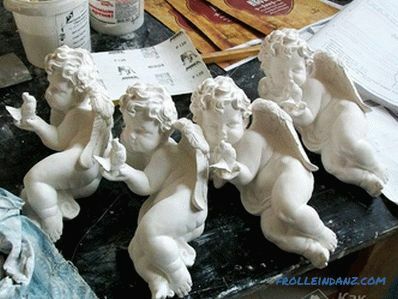 The figure can be classically white or painted in different colors. The choice is determined by the customer. First of all, you need to decide on the appearance of the future work of art, its size, location. The best option is making a stencil of full size or drawing a pattern on the surface to be decorated. The options are infinite. The simplest - the stars, flowers, snowflakes, letters. You can decorate the room with original three-dimensional paintings - landscapes, still lifes. 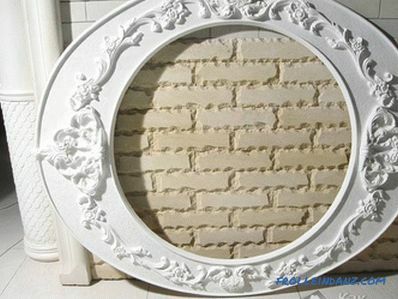 "Carved" frame will allow to achieve complete imitation. Preparation of the gypsum solution For the casting of large gypsum products, the solution is prepared in small portions. 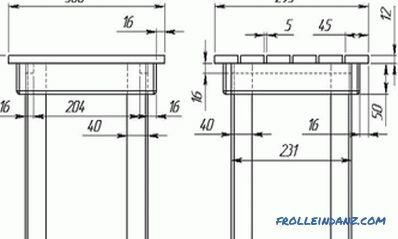 The thick solution flows poorly and does not completely fill the form, which has a thin relief. 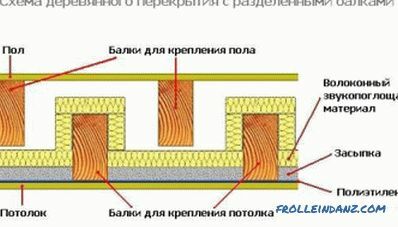 The glue solution can slow down the hardening reaction — gelatin, mezdrovy. 25% glue water concentration is recommended. It should be used within one day. 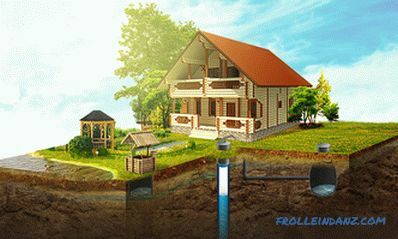 In addition, the use of adhesive solution gives the product strength. 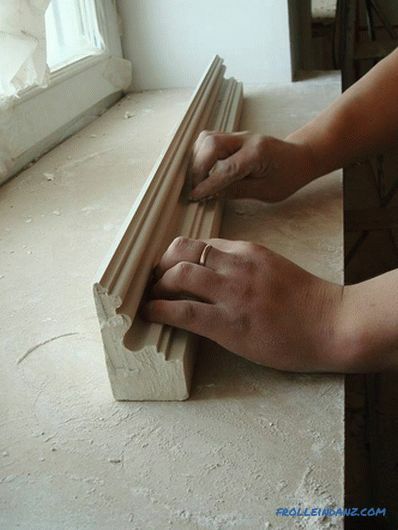 Flat products are rubbed to a flat surface, sprinkled with fine gypsum flour and left for 24 hours. Production of stucco from gypsum can be done in several ways . Stencils draw the outlines of the future composition. Gypsum mass is applied to the surface, leveled, rubbed. Then all the excess is trimmed. If necessary, the procedure is repeated. 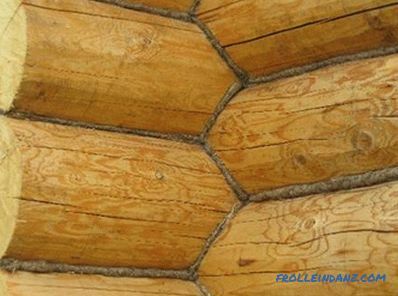 This method is suitable for creating stucco with a fairly simple surface configuration. A solution is applied to the location of the stucco. Then dried gypsum is processed according to the picture. Products of complex configurations are made using molds. They can be made of wood, plastic or concrete. First, the form is richly lubricated with soap gruel. Then a plaster mortar is poured into it. The maximum layer thickness is 1 cm. The next layer is filled only after the previous one has completely set. A well-cured product is gently released from the mold. In addition, you can make a model completely or its fragments from plasticine. This material can change shape infinitely many times. 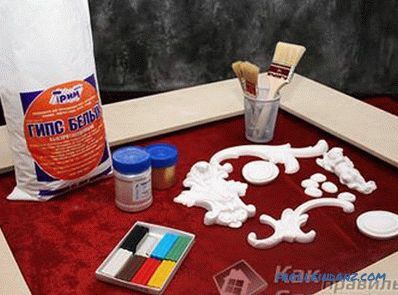 On the finished plasticine decoration plaster solution is applied with a brush. 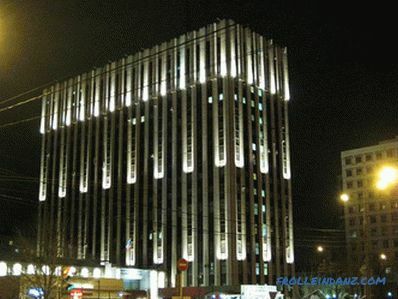 Careful coating of the recesses is a guarantee of the future shape of the product. Further layers are applied with a spatula only as the previous ones dry. An hour later, the form is removed from the clay model. When creating products of large forms, it is reinforced with a copper grid. From the inside the ready form becomes covered with a colorless furniture varnish. When pouring a gypsum slurry into the mold, it is necessary to avoid the appearance of air bubbles in it. A light shake will provide complete filling of small reliefs. 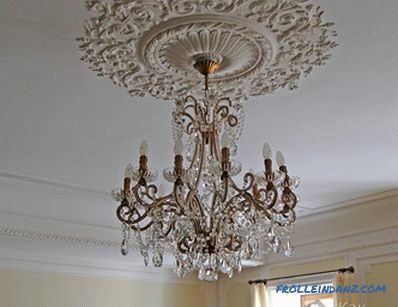 Drying of gypsum products should be carried out at a temperature of at least +16 0 C. After thawing, they are destroyed. 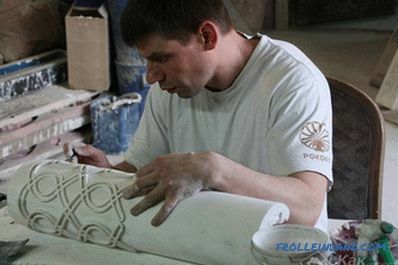 You should not try to speed up the drying process with a fan, heating devices - plaster will warp. Deficiencies are eliminated with a knife, then the product is ground with fine emery cloth. 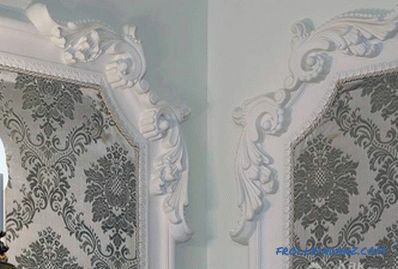 The white gypsum surface can be painted with water-based paint. Before that, it is covered with two layers of primer. With the help of pieces of fabric, sponge, synthetic materials, you can give stucco any texture. The installation location of the future product is thoroughly cleaned washed from whitewash. A notch on the back and mating surfaces will help to hold the binding solution more firmly. Small, lightweight parts can be fixed with liquid gypsum. Large elements are mounted using special mounts. Holes are drilled in them and in the surface of the wall or ceiling, into which screws are attached with dowels or wooden inserts. Inside the plaster products are fixed metal loops. During installation, they are put on the heads of the screws. A lacquer coating will prevent rust on metal fasteners. Metal pins can be mounted into the wall, then they are pressed into the stucco holes filled with grout. Before planning large compositions, it is better to practice making small figures. You can also make an ornament of individual modules.